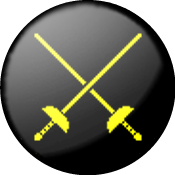 The Kingdom Rapier Marshal is responsible for all rapier activities in the West Kingdom. Interested in rapier or Historical Fencing? Have questions? Please feel free to contact the Principality Rapier Marshal of your area or the KRM above. Not sure what area you're in? Find out here! Rapier Combat Rules: Files with PDF next to them require the Adobe Acrobat Reader to view them. Download the reader here.